The accommodation on Wadigi is made up of superbly appointed spacious suites: Honeymoon Suite, Sunrise Suite and Sunset Suite all offer large living room with breathtaking ocean views. All suites have en suite bathrooms with large baths and are fully air-conditioned. Each suite is individually decorated and ensures that guests have individual privacy and absolute comfort. The suites are connected by expansive decks which allow indoor/outdoor living and feature day beds for relaxing in the sunshine. For more detail on the suites at Wadigi, see Suite information on the link above. 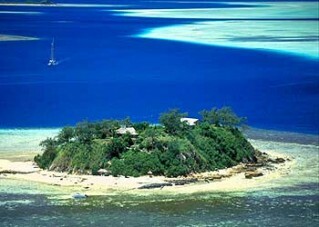 Wadigi is situated in the Mamanuca Islands of Fiji and the Pacific Ocean. The Island can easily be reached from Nadi International airport by Helicopter or seaplane within 15 minutes from take off. If you would prefer to go by boat there are water taxis available from Denaru Marina which will take approximately 50 minutes from departure. Wadigi is a luxurious five star private island resort located in the Mamanuca Islands in Fiji. Wadigi Island offers guests complete seclusion, luxury accommodation, pristine white sandy beaches, crystal clear waters and unforgettable gourmet dining experiences. This 5 star private oasis is made up of a villa with three exclusive suites perched on the edge of Wadigi’s cliff and offers panoramic ocean views. Your personal staff of seven will cater for your every whim ensuring that your stay at the Wadigi is cherished forever. Choose between a dip in the islands infinity pool with spectacular sea views or taking a dip in the crystal clear waters of the lagoon. Relax on a sun lounge and take in the glorious sunsets or snorkel in the protected waters and experience some world class coral reef. Whether your looking to get away as a couple or with a group of friends or family, Wadigi can offer you complete relaxation and rejuvenation and will keep your entertained with a host of water sport and land activities. Wadigi Island has an extensive range of water sport activities available to choose from. The professional staff will ensure that you can take maximum advantage of the crystal clean waters surrounding the island. Whether your a Professional or a beginner the Wadigi water sports staff will ensure that you have loads of fun. For more information on Activities see the Activities at Wadigi link above. Whilst dining at Wadigi each individuals tastes are catered for by the islands two gourmet Chefs. Let them tempt you with the finest fresh tropical seafood and produce as well as decadent desserts. All meals will be accompanied by a variety of the best wines from the vineyards of Australia, New Zealand and France stocked in the islands international cellar. Your hostess will prepare cocktails for you throughout the day as requested. If Relaxation is more your thing, that is taken care of too as some of the islands staff are trained in massage.